4,141 Original Miles * Garage Kept & Stunning! * Loaded * Easy, Instant Financing! 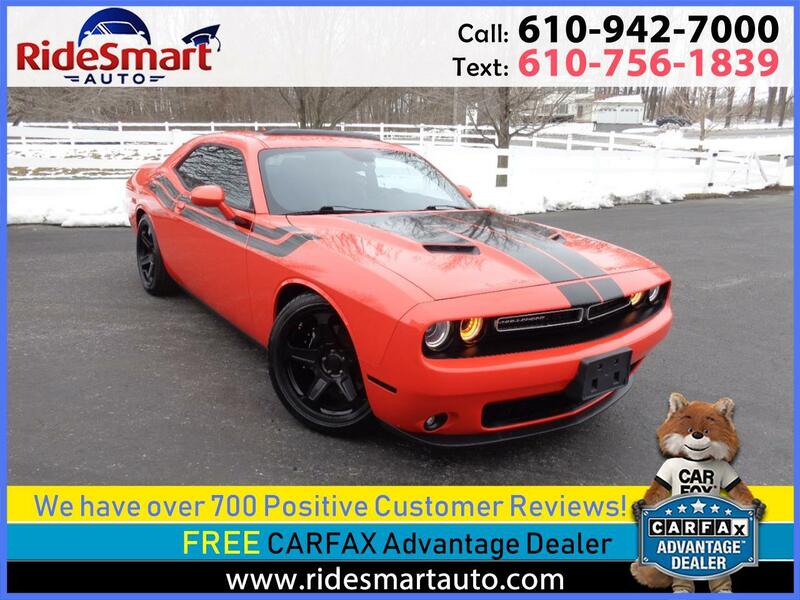 Incredible Mango Orange 2016 Dodge Challenger SXT Plus * 4,141 Original Miles * Garage Kept & Stunning! * Loaded w/Navigation, Power Sunroof, Leather, Heated/Ventilated Seats, Heated Steering Wheel, Rear Camera, Shaker Hood, Rear Spoiler, Factory Warranty, Super Sharp! This Plus version includes Navigation with a 8.4-inch touchscreen with smartphone integration and voice command plus satellite radio, a Power Sunroof, power-adjustable steering wheel, leather upholstery with heated and vented front seats, a heated steering wheel and upgraded alternator, plus an upgraded stereo and fog lights. This Challenger SXT with a 3.6-liter V6 delivers 305 hp and 268 lb-ft of torque, but that’s not the impressive part. That combination will get you to 60 mph in just 6.4 seconds, but it’ll still manage 19 mpg city and 30 highway, with a combined rating of 23, and this from a car weighing nearly 4,000 pounds. This is helped by an 8-speed automatic that does its job with responsive grace. Not only is the Challenger the only option in the class that can truly be called a muscle car, it also sports the highest level of refinement inside among the competitors. Materials, design, and fit all surpass the Mustang and the Camaro, and the Challenger is the only one of the three that offers a usable rear seat and a reasonable trunk. It’s got 16.2 cubic feet there, versus the Mustang’s 13.5 and the Camaro’s comparably shameful 9.1. Want to take a trip and bring three friends? This is the right sports car coupe to do it in. The Challenger is the only one that truly offers all-day comfort. The Challenger that will leave you the most refreshed when arriving thanks to comfortable seats and a well-balanced suspension. That’s important, especially for the older demographic looking to relive the misspent youths the current crop of muscle cars caters to. The Challenger captures the visual aesthetic of the car it’s based on better than the Mustang or the Camaro. The Mustang looks too much like a squashed Fusion, and the Camaro too much like a life-size Matchbox car. If you want a modern muscle car, the Dodge Challenger is really your only option. The Mustang and Camaro are currently sports cars, and the Charger is a 4-door sedan. That means the Challenger is the only place you can spend your money on a muscle car and actually get what you paid for.